The Caesars Cup is a Ryder Cup style battle of poker giants – contested by two teams representing the Americas and Europe, and one of the most keenly anticipated events at this year´s WSOPE. Originally hosted in 2009 (and won 4-1 by Europe – you can read about it here), the event is being reprised at the conclusion of the WSOPE Main Event and will be played on the new date of Wednesday 19th October at the Le Croisette Casino in Cannes. The Caesars Cup will feature the game No-Limit Hold’em, with two teams of five doing battle over a series of unique partner and heads up formats, with points awarded for each victory. The unique formats will include alternate betting and other non-traditional elements as players aim to win points for their respective teams. European captain, Bertrand Grospellier, who was himself in the victorious team of 2009, has kept faith in winning team members Dario Minieri and Gus Hansen and included Jake Cody and Max Lykov for a truly international team. After announcing his team, Grospellier was quoted as saying “I am very confident in my team. We will show the Americas that 2009 was not an upset!” Grospellier has followed in the footsteps of his predecessor, Annette Obrestad, by picking a very young team. The average age is just 27 years as opposed to the 51 years average age of the American Team. Captain America – in the guise of Phil Hellmuth – was far more vocal in his assessment of the fixture. “These idiot Northern Europeans think they know everything about the game of poker,” joked Hellmuth. “Well, we plan to show them that decades of experience are much more valuable than clicking a mouse while sitting in your pyjamas.” Hellmuth´s team is comprised of 2009 losers Daniel Negreanu, Doyle Brunson and Huck Seed, and includes Johnny Chan as the fifth member – the man Phil Hellmuth beat in the conclusion of the 1989 Main Event to deprive the “Orient Express” of an unprecedented third consecutive Main Event bracelet. This made-for-TV event will form part of the WSOPE coverage, but is sure to attract global interest while it is taking place – just for the rivalry between the two teams. The format will definitely suit Jake Cody and Gus Hansen, who have proved themselves to be amongst the top heads-up players in the world at the moment, but the European victory in 2009 hurt the American´s pride and they will be out for revenge. 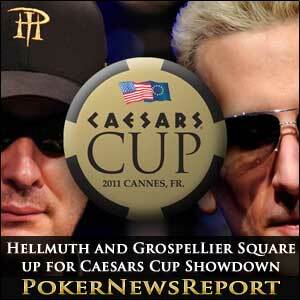 Check out Poker News Report regularly for coverage from Cannes and all the events at the WSOPE.